My Rating: Sensational, stirring, amazing photography! As you may recall, I am a fan of astronaut Chris Hadfield. He is among the very few famous people I greatly admire, so I was thrilled when my nephew gifted me his book, You Are Here: Around the World in 92 Minutes: Photos from the International Space Station. I love it! It is full of the magnificent photos Chris Hadfield took during his last mission – from December 2012 to May 2013 – on the International Space Station. His view of the world from way out there was captured in many amazing shots. Out of the approximately 45,000 photos he took, the ones in this book are some of his favourites, most never seen before. Each section gives us a perspective only attained from space combined with Chris Hadfield‘s wonderful way of explaining what we’re seeing. At the end of the book is a photo location map. “Every photo’s page number is pinned to the corresponding location on a world map.” (quoted from page 194) It is fun to go back and look at the photo that matches up with the number on the map. You Are Here: Around the World in 92 Minutes: Photos from the International Space Station is such a beautiful book. It’s one I urge you to purchase, if only to get a better grasp of our mysterious and wondrous planet. You will be awed. 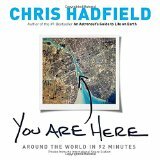 You can find You Are Here: Around the World in 92 Minutes: Photos from the International Space Station listed on my BUY THE BOOK! page. This entry was posted in Mostly About Reading, Reviews & Interviews and tagged Arts, Book review, Canadian astronaut, Canadian author, Chris Hadfield, International Space Station, Photography, Random House Canada, You Are Here: Around the World in 92 Minutes. Bookmark the permalink. I got this book for Christmas. I still pick it up once in a while and flip through the photos. Just beautiful. I really enjoyed An Astronaut’s Guide to Life on Earth, too. This would be a great book to own. I also am an admirer of Chris Hadfield. You’d love this one, Darlene.